If you check any list which ranks the most important Sustainable Development Goals (SDGs), you won’t find SDG 17: Partnerships for the Goals at the top, or even near the top, of any of them. Focus and funding for the SDGs is heavily weighted towards more well known global issues like ending hunger (SDG 2) and achieving quality education for all (SDG 4). To date, from technology to resources, this has been a slow process. When we check up on the global progress towards achieving SDG 17, the vast majority of countries fall well short. As long as this continues to be the case, the prospect of achieving the other 16 Goals will remain difficult, if not utterly unachievable. Partnerships and Goals refers to the need for cross sector and cross country collaboration in pursuit of all the goals by the year 2030. It is a call for countries to align policies. It is a vision for improved and more equitable trade, as well as coordinated investment initiatives to promote sustainable development across borders. Put simply, it’s about strengthening and streamlining cooperation between nation-states, both developed and developing, using the SDGs as a shared framework and a shared vision for defining that collaborative way forward. SDG 17 targets are broken down into five categories and each target has a number of indicators. Sample targets and their respective indicators are shown in the table below. For the source of the table data and the full list of targets and indicators, click here. 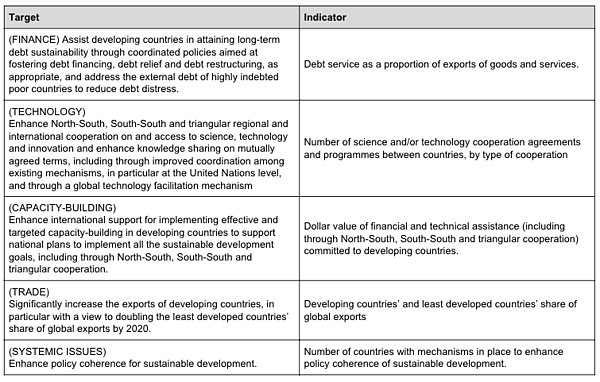 What SDGs are ranked as most important? What makes the headline news is always going to hold greater weight in the minds of the masses. Some experts believe we must focus on curbing climate change, which will have positive effects on the other goals as well. Others think education should be the top priority because of its potential to break the cycle of poverty and generate systems change across other urgent areas of global need. One study, which asked 85 experts around the world to define their top 20 SDG targets and rank them in order of importance, found that their top targets (you can find the full rankings results here) included access to healthcare, poverty elimination, and women’s rights. Anything related to policy did not make the list, with only one partnership-related target appearing in the lower cluster of rankings. Another tool, the SDG Index and Dashboard Report, can help us understand the relative importance of each SDG by showing country by country progress towards achieving each one. For example, the image below shows progress towards achieving SDG 7: Affordable and Clean Energy. There is work to be done. But it is apparent that significant progress has been made. Now, let’s look at the same global progress map for SDG 17: Partnerships for the Goals. It is clear that significant and major challenges remain in the majority of the world. What is most striking is that many regions of strong economic status perform very poorly, like the United States and much of Europe. 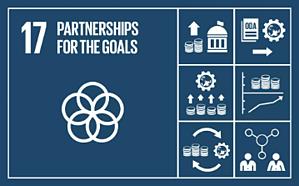 Why is 'Partnerships for the Goals' the Most Important Sustainable Development Goal? Quite simply, without significant progress on SDG 17, achieving the rest of the first 16 goals will be a near impossible task. The fact that some of the world’s richest countries are essentially failing SDG 17 is especially troubling because of the structure of the Goal itself. It calls for those countries which are more well off to assume a larger responsibility. That could mean leading coherent policy development (Target 17.14), supporting capacity building in developing countries (17.9), or improving access to sustainable technologies and technology development in emerging economies (17.7). What the red areas of the map shown above tell us is that these things simply aren’t happening at the rate they need to for developing countries to be able to step up and contribute to addressing the SDGs. In other words, when world leaders convene in 2030 to assess how we’ve done with the SDGs, they’ll be doing so in a world which has grown the most in regions most affected by issues of hunger, poverty, healthcare, etc. If steps aren’t made to coordinate, collaborate, and convene within and between countries to work together towards the SDGs, the likelihood of achieving them becomes slimmer year after year. Effective governance of data. In other words, proper oversight and accountability as the data flows between entities. Standardized data languages. As long as it remains context-relevant, standardized metrics enable greater comparability and ease data management amongst different players. Accessibility of data. From interface design to reporting platforms, making data available to the masses is key. Impact data management systems like Sopact's Impact Cloud offer an end-to-end solution to the needs discussed above. It's cloud-based structure also enables greater collaborative power, from community leaders and national policy makers, to impact investors and social entrepreneurs. And collaboration really is the key to any of the goals. Because the SDGs do not represent a set of individual global issues. They are interconnected, each affecting the other in myriad ways. To disrupt the cycles at work that have made the SDGs necessary it is also necessary to disrupt the ways in which we we work together to achieve systemic change. As we know SDGs are not 17 square boxes, they have to work with each other and in balance. We can start by taking SDG 17, Partnerships for the Goals, seriously as the most important Sustainable Development Goal and reap the benefits of a world truly working together.